From Michael Maier's 1617 book of emblems. 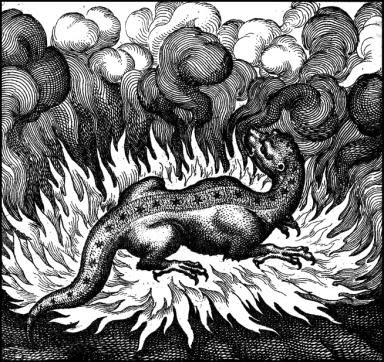 The salamander was thought to be born of fire. If one can say that hot-glass workers have a mascot, it is without any doubt the salamander. Since ancient times, this lizard-like, poisonous skinned amphibian was ascribed to exist within fire, even to be born out of the flames. According to legend, its cold body allowed it to survive the heat. To see one in the flames of a furnace was considered good luck, but glassblowers who suddenly disappeared (to work elsewhere) were said to have been "eaten by the salamander." When I was about five years old my father happened to be in a basement-chamber of our house, where they had been washing, and where a good fire of oak-logs was still burning; he had a viol in his hand, and was playing and singing alone beside the fire. The weather was very cold. Happening to look into the fire, he spied in the middle of those most burning flames a little creature like a lizard, which was sporting in the core of the intensest coals. Becoming instantly aware of what the thing was, he had my sister and me called, and pointing it out to us children, gave me a great box on the ears, which caused me to howl and weep with all my might. Then he pacified me good-humouredly, and spoke as follows: 'My dear little boy, I am not striking you for any wrong that you have done, but only to make you remember that that lizard which you see in the fire is a salamander, a creature which has never been seen before by anyone of whom we have credible information.' So saying he kissed me and gave me some pieces of money. Incidentally, at the end of Cellini's life, family friend and Church canon Piero della Stufa was appointed to settle his estate. Among other items, he was entrusted with the manuscript for Cellini's autobiography, from which the above quote is taken. Della Stufa was also the godfather to Antonio Neri's younger brother Vincenzio. * This post first appeared here, in a somewhat different form on 19 August 2013.